This very prestigious resort annually wins many awards, including the Hotel of the Year Awards has named Conrad Maldives Rangali Island as the Best Luxury Resort Worldwide 2015. 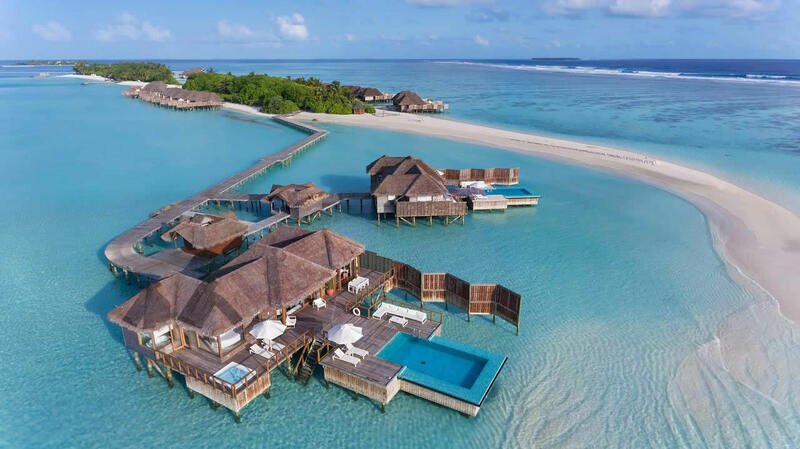 The resort also took out top prizes for Best Luxury Overwater Villa Worldwide 2015, Best Resort Worldwide 2015, Best Private Island Resort Worldwide 2015, Best Resort Maldives 2015, Best Hotel Private Airport Lounge Worldwide 2015 and Best Underwater Restaurant Worldwide 2015. Alternatively, arrive via a luxury three-hour yacht transfer. Your Conrad Maldives experience begins before you arrive on Rangali Island. With complimentary access between 7am and 5pm, their private lounge at Velana (Malé) International Airport ensures your arrival at Conrad Maldives is seamless and stress-free. Expect: award-winning airport lounge, complimentary neck or shoulder massage, Kids’ play room, wi-fi and shower facilities, Complimentary breakfast buffet, Extensive dinner buffet. 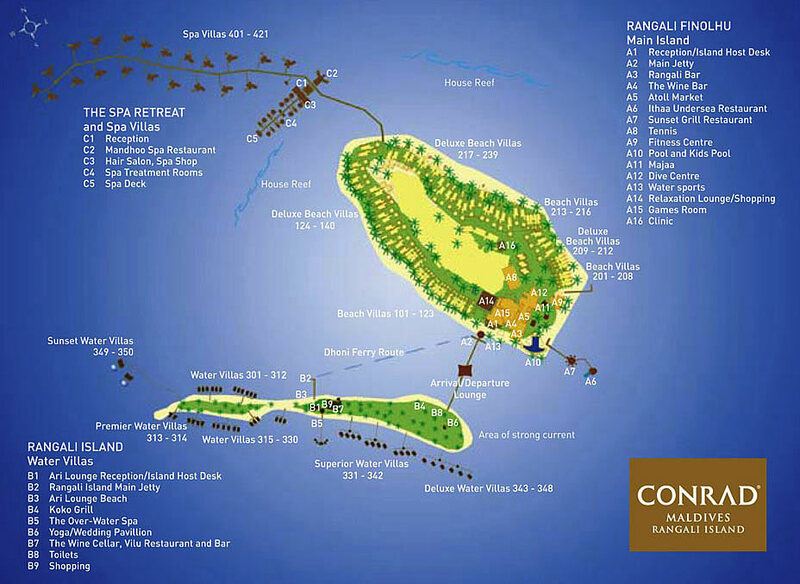 Conrad Rangali - without a doubt, the most magnificent and most expensive hotel in the Maldives, very high class. Quality service complies with the international standard Hilton, with a full set of facilities and optimum comfort, both in public and private areas. All villas are masterly built, and are full of greatness and luxury to infinity. Hidden in greenery, 79 beach villas, renovated in 2010, breathe exoticism in full growth. 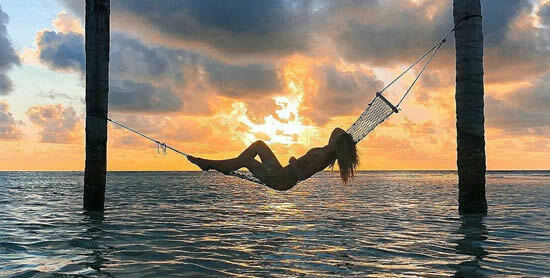 Dreaming of infinity pools, personal spa rooms, or may be a steps leading into the Indian Ocean? Find yourself in a variety of contemporary land and water villas with stylish interiors and exquisite bathrooms. Dotted above the waves or tucked amongst the tropical greenery the villas are very modern and have all the expected amenities to make your stay as comfortable as possible. The each location allows guests the utmost privacy and opportunity to connect with nature and the Maldivian culture. With the Spa Retreat and Beach Villas on Rangalifinohlu Island and Water Villas on Rangali Island, the resort offers the widest choice of accommodation in the Maldives. Each of the 150 villas reflect the resort's contemporary and laid-back style, providing each guest with luxurious modern facilities within an indoor-outdoor living space that sits in perfect natural harmony with the Maldivian environment. All rooms are equipped with full entertainment systems, including satellite TV and DVDs. The Beach Villas have large outdoor garden bathrooms and as well as being larger, the Deluxe Beach Villas also have private plunge pools. The water villas come in a variety of guises with enhanced bathrooms and bedroom facilities. Spa Water Villas, number 2, open all around the ocean are simply sensational. As for the 50 Water Villas, decorated with impeccable taste mostly from wood, they have a terrace with a staircase leading directly to the lagoon. Some rooms have a private bathroom with breathtaking views of the lagoon, others have a jacuzzi on the private terrace. 2 Sunset Water Villas, a bit isolated in the corner of the lagoon, especially stunning beauty. Water Villas (Premier, Superior and Sunset), refurbished in 2011, are incredible, but only adults are accepted. Set on the beachfront the 150m² villa feature a glass-walled bedroom which opens onto a terrace and small private garden, leading to the beach. To the rear, a fountain courtyard is part of the open-air garden-bathroom with a thatched-roof bathing pavilion, featuring an outsized bathtub and romantic mood lighting. Twin Beach Villas have two separate single mattresses on the sleep platform. In 2018 Conrad Maldives Rangali Island redeveloped Deluxe Beach Villas. Continue to be one of the resort’s most popular villa categories, each room is set amidst dense tropical flora and fauna offering the utmost in privacy. Rich natural and understated interiors are accented throughout the spacious living areas that are illuminated with natural light and a Japanese-inspired garden with outdoor seating area, and private access to the palm fringed beach are key design features of the Deluxe Beach Villas. An abundance of space (up to 300m²/3229 sq. ft) is the hallmark of the Deluxe Beach Villas. Enjoy absolute comfort in spacious bedrooms with floor-to-ceiling windows on all four sides that can be fully opened to bring the natural beauty of the Maldives into the room. A large private garden and plunge pool, just steps from the beach and elegantly screened by exotic tropical foliage, complete the experience. The open-air garden-bathroom is a pleasure of senses, from the scent of frangipani flowers to the relaxing sounds of the fountain. The enormous bathing pavilion calls out for candles, flower petals and sumptuous oils which can be ordered from the in-villa bath menu. Fully refurbished in 2012, the ultimate in island luxury is in the stunning Sunset Water Villas (452m2), set on stilts in their own private area of the lagoon. Home to royalty, celebrities and the world's top sport stars, glass-floors in the living room provide spectacular views of the marine life below, whilst a round bed rotates 270 degrees to follow the breathtaking sunsets. The large marble bathroom with walk-in wardrobe and ocean-view circular bathtub, plus a luxurious outdoor whirlpool and a private, over-water, chromotherapy infinity swimming pool, are just a selection of the extravagant touches which make the Sunset Water Villas the ultimate luxury experience. The second king-sized bedroom has a flat-screen TV which descends from the bedroom ceiling, adjacent bathroom with open air shower. This villa also comes with kitchenette and butler service 24 hours a day, flat screens and satellite TV throughout, DVD and CD players and Bose sound system. The Family Water Villas, (150m²/1614.6ft²) are set on stilts in the resort's lagoon, near the Spa Retreat. Their spacious design blends contemporary Maldivian style in a natural harmony of wooden interiors, thatched roofs and a breezy indoor outdoor feel. The ocean is always in view allowing guests to feel at one with nature. The spacious bathroom includes large dressing area with day bed, and bathtub with ocean views. On the private sundeck is a large whirlpool and steps leading directly into the lagoon. A wine and dine destination itself, Conrad Maldives is a true epicurean experience with a choice of 12 restaurants and bars, including Ithaa, the world's first all glass underwater restaurant. You can talk for a long time on the culinary theme in Conrad Maldives, where fine cuisine and delicious breakfasts generously satisfy the tastes of spoiled luxury guests. Each restaurant features its own distinctive favour that takes its cues from the world over, and is injected with a touch of Maldivian fare. Enjoy exclusive award-wining beachside dining at Vilu Restaurant and Bar. Dedicated to the art of food and wine pairing, Vilu Restaurant is located on the edge of the lagoon, and features indoor and outdoor spaces. The stand-out feature of the restaurant and bar is the extensive wine selection that has been expertly matched to the contemporary inspired cuisine on offer. Ufaa (which means ‘happiness’ in Maldivian) is presented by celebrated Chinese Chef Jereme Leung. Ufaa is an innovative Chinese culinary concept that, showcases authentic experiences which highlights the iconic favors from the distinctive cultures and provinces across China. Ufaa is a multifunctional space featuring private and communal areas, and karaoke and Mahjong. Sitting five metres below the surface of the Indian Ocean, Ithaa is the world's frst undersea restaurant located at the Conrad Maldives Rangali Island in Alif Dhaal Atoll, offering 180-degree panoramic views of the vibrant coral gardens surrounding it. The food offering is a true delight and features a distinctive set lunch and dinner menus featuring local spices and produce blended with Western infuences matched with fine wines. Means 'mother-of-pearl' in Dhivehi, this amazing restaurant is also open for mid-morning cocktails. Ithaa can be reserved for private dining, weddings and special occasions. Located on the beach, Koko Grill is an intimate and lively dining experience. Watch fames dance on the open grill as chef prepares up to 10 courses of Japanese cuisine under the stars. Mandhoo restaurant offers an organic menu is arranged into the five elements, each with a specific taste, temperature, level of moisture and density, with their associated cuisines designed to affect the body, mind and spirit in different ways. Located two meters underground, and featuring a list of up to 20,000 bottles and 1,400 labels – the most in the country, The Wine Cellar is the setting for degustation dinners hosted by the islands head chef and chief sommelier, who skilfully match a fve-course menu with up to eight hand- picked wines. Recognised with an award for excellence in 2014 by Wine Spectator, Vilu Restaurant and Bar is dedicated to the art of food and wine pairing. Located on the edge of the lagoon, Vilu is an open air restaurant that showcases the resort’s extensive wine selection that has been expertly matched to the contemporary inspired cuisine on offer. A respite from the revelry, The Quiet Zone is an adults-only, open-air bar is complete with comfy daybeds, chilled music and a beach backdrop. A perfect place to drink, dine or do nothing, the bar is your hangout from morning till late. Try their playfully paradoxical cocktail list. Featuring nostalgic themes and fresh ingredients from the resort’s hydroponic garden, dip into carnivals, candies and youthful temptations – spiked with your favorite grown-up additions. In addition, the resort offers special events such as private beach barbecues, full moon dinners, themed beach barbecues as well as in-villa dining to make your stay just that bit more special. The guest chef and guest wine-maker programme adds more flavours to the comprehensive menu of delicious dishes. On a delicate theme - what to do in Conrad Maldives - guests do not have a headache, every day is filled with fun activities and busy with exciting entertainments. Conrad Maldives Rangali Island has many excellent facilities to offer including a fully equipped gym, a spa, infinity pool, eight restaurants, three bars, a library, yoga, PADI dive centre, water sports centre, and a Kid’s Club. With an adventure diver certification course and a day and night scuba experiences, 5-star OCEAN diving center PADI must come first, and also here you can get a free snorkel gear if you want to explore a vibrant marine life on a unique house reef. 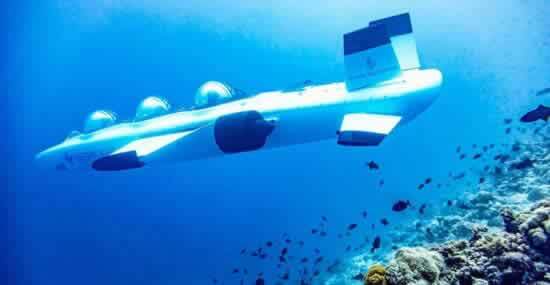 If you are lucky expect to see whale sharks, manta rays and turtles! Majaa at the Conrad Maldives Rangali Island resort ensures that children between the ages of 3-12 years are kept busy from 8:30am until 6:00pm, and from 7:00pm to 10:00pm with an outstanding themed daily programme specifically tailored to different age groups. A wide range of indoor and outdoor activities are hosted by the highly-trained youth team members. Babysitting can be arranged whenever for all ages. The resort's experienced instructors offer a wide range of motorized and non-motorized experienceses that suit your taste for adventure. Activities available at the fully equipped Watersports Centre include catamaran sailing, windsurfing and canoeing, wakeboarding, X-Jetpacking, X-Jetblading, knee boarding and water cycling. By and large, Conrad Maldives Rangali Island gets nearly unanimously positive reviews from a wide range of past guests, making this one of the most reliable choices in its price range. Everything from the luxury amenities in the rooms to the personalized service to the food in the award-winning restaurants gets high marks.